The latest NBC/WSJ poll release shows that Clinton would beat Cruz and Trump but fall to Carson or Rubio. And Trump is still leading the national GOP horserace, but Cruz has zoomed into second place. And here's the Des Moines Register poll showing Cruz with a lead in Iowa. 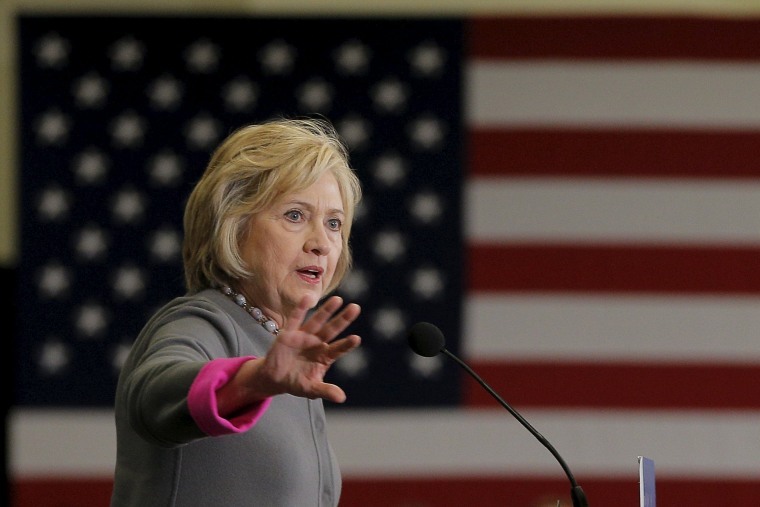 Clinton is also dominating in Iowa, although Sanders still poses a threat. Christie is back on the main debate stage and Rand Paul clung to his spot as well. The AP notes of Trump and Carson: "State filing deadlines would give the two Republicans until about March to launch independent or third-party campaigns, experts said. That would give a well-financed campaign enough time to gather sufficient signatures on petitions so the candidate could appear on the ballot in every state." CLINTON: From TIME: "A conservative watchdog group has called for another federal investigation into Hillary Clinton’s communications during her time as Secretary of State, accusing Clinton of giving special government access to an investor in a deep-sea mining company because of his connections to Clinton’s son-in-law." The New York Times: "As her chances of becoming the first woman to be nominated by a major political party improve, many women are considering how much gender should play into their decisions to embrace Mrs. Clinton’s candidacy — or not." CRUZ: The Wall Street Journal compiles the data behind the Cruz rise. And writes the Washington Post: "Micro-targeting of voters has been around for well over a decade, but the Cruz operation has deepened the intensity of the effort and the use of psychological data." On Meet the Press, he said that "three or four countries... are providing military force" within the anti-ISIS coalition. PolitiFact says that's "mostly true." In a new ad, he laments the "millions with traditional values branded bigots and haters." TRUMP: NBC's Ali Vitali outlines the inevitable clash between Trump and Cruz after the real estate mogul called off the truce between the two. On CNN over the weekend, he suggested that he has "far better judgment" than Cruz. The AP checks in with supporters who are baffled by the outcry about his Muslim ban comments. "Working to ease public jitters ahead of the holidays, President Barack Obama will use visits to the Pentagon and the National Counterterrorism Center this week to try to explain his strategy for stopping the Islamic State group abroad and its sympathizers at home," writes the AP. The New York Times takes a big look at the climate deal that was six years in the making. Worth noting: "French voters dealt a sharp setback to the far-right National Front in regional elections on Sunday, depriving the party of victory in any of the country’s 13 regions, according to projections based on exit polls. A week after the National Front came out on top in the first round of voting, France sent a far different message, with the party losing even in a northern region where its charismatic leader, Marine Le Pen, had been widely expected to win." *** Monday’s “Andrea Mitchell Reports” line-up: Joining NBC’s Andrea Mitchell at 12p ET – the Washington Post’s Anne Gearan and Chris Cillizza; NBC’s Kristen Welker and Jim Miklaszewski as President Obama makes a statement after meeting with his National Security Council at the Pentagon; NBC’s Hallie Jackson and Katy Tur from Las Vegas with a GOP debate preview; NBC’s Pete Williams on the latest in the San Bernardino terror investigation; plus NBC’s Kate Snow shares her conversations with Sandy Hook families on today’s anniversary.